May 17th, 2018 – Years before Bill Maher was forced to apologize for saying the n-word on his show Real Time, he was saying it on ABC’s Politically Incorrect. 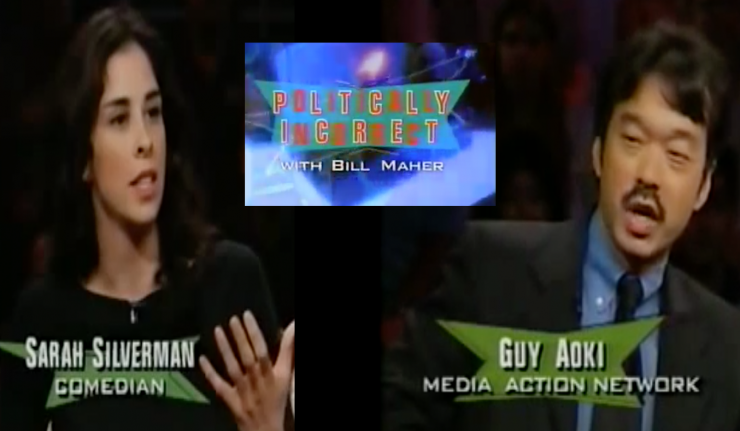 During a 2001 episode that tackled racism and comedy, the n-word was paired up with the word “chink.” Comedian Sarah Silverman was booked as a guest alongside Guy Aoki, a Japanese-American civil rights activist, who had taken offense with her using the word during a taping of Late Night With Conan O’Brien. The joke was met with light, awkward laughter as one would expect knowing why the panel was gathered in the first place. Anne-Marie Johnson turned to Silverman and asked “Where is the joke” before Aoki could get in his first planned sound bite. On his MANAA (Media Action Network for Asian Americans) blog, Aoki recounts that he prepped for the appearance as if it were an oral exam in college. He was upset that the producers had brought only Silverman onto the show weeks before to discuss the joke, and he knew he would only have a limited amount of time in each segment. Silverman and Aoki sparred over the different ways in which they try to illuminate racism. Aoki agreed that humor can be a tool to spark difficult discussion but deemed Silverman a less than worthy humorist. The whole panel, minus the still uncomfortable Spade, dove into other familiar FOO questions: who has ownership of certain jokes and does an offensive joke have merit if it triggers honest dialogue? “If you want to talk about the Jewish community and make jokes about them, that’s fine. But once you start making them about other ethnic groups, there’s a different element that comes into place,” Aoki said. Silverman again responded that the different element in place is that “it provokes thought,” and that’s also what her fellow comedian Conan O’Brien said. What did you think about Sarah Silverman’s “chink” joke? Do you view it differently today than you would have in 2001? Give us your thoughts!